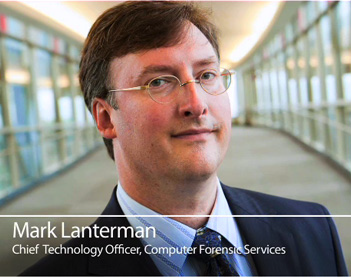 Editor’s Note: We are pleased to welcome a guest blogger Mark Lanterman, Chief Technology Officer of Computer Forensics Services, Inc, (CFS) a Minnesota-based eDiscovery and computer forensics services firm. CFS features an innovative and cutting-edge practice supporting social media investigations. Social media is now a very public extension of an individual’s life. Its widespread appeal and ease of use has given rise to new digital profiles that share extensive and mostly publically available information. However, despite being a treasure trove of potentially relevant information, social media is often overlooked in litigation. In my practice — involving matters performed on behalf of law firms and law enforcement agencies — social media is, more often than not, a crucial stone to upturn for key evidence, and in many cases proves to be the “smoking gun”. In fact, social media evidence is relevant and important over 70 percent of the cases we handle. And thanks to the public nature of social media evidence and the automation and scalability of X1 Social Discovery, we are able to proactively collect social media evidence in our cases, which has been a game-changer in several instances. For instance, I recently received a call from the local sheriff’s office regarding a series of threatening Twitter and Facebook posts being made against public figures. The mentally ill man responsible for the posts included updates and photos from his visits to the pubic figures’ homes. The up-to-the-minute captures we obtained with X1 Social Discovery gave law enforcement the opportunity to catch up with the suspect before he was able to elevate his threats and/or delete his threatening posts. Furthermore, X1 Social Discovery’s collections are easily delivered to the necessary parties in a timely manner, which allowed law enforcement to charge the man with terroristic threats and stalking. Social media is also extremely valuable for eDiscovery investigations in civil cases. For example, in a recent intellectual property theft suit, I used X1 to collect the publicly available LinkedIn profile of a disgruntled employee, who left her company for a competitor. The woman’s LinkedIn profile disclosed that she began her tenure with the competitor nearly three months before she officially quit. Using the date provided, I was able to determine that same week she copied thousands of confidential electronic records to a USB thumb drive from her work-issued laptop. The evidence collected by X1 Social Discovery proved to be extremely valuable, and when used in conjunction with other evidence, a settlement was reached in a matter of hours after the analysis results were produced. In this way, social media provides important context to other aspects of discovery. In fact, it is now a routine practice for us to proactively preserve social media evidence, even if not explicitly requested by our clients. Earlier this year, I was working on a civil case and, immediately upon being retained, collected the opposing party’s public Facebook and Twitter profiles using X1 Social Discovery. A few weeks later, I brought to the attention of my client the fact that this person’s Facebook and Twitter accounts had been deleted shortly after the Court had entered a preservation order. Thankfully, we had collected these accounts ahead of time; which contained relevant information, including incriminating posts that weakened her case. The matter was settled within a week. Often, lawyers are uncomfortable about social media collections given its newness and bad experiences when relying on screen captures. It’s true that social media collections can present unique challenges when best practices are not utilized. But as it is now essential to nearly all digital investigations, I am always sure to advise my clients about collecting it, something that would otherwise be very burdensome and would not scale without X1 Social Discovery. With the ever-changing nature of computer forensic investigations and e-discovery, it is important for attorneys and investigators to keep an open mind, as well as stay current on social media’s growing capabilities, which are expanding goldmines for potentially relevant information. Once litigation has started, it is important to preserve everything that could be deemed relevant. With the ease of access afforded to users and the semi-volatile nature of social media data, X1 allows for an efficient and admissible collection method.